I am presiding at the Eucharist in the Chapel of the Church of Ireland Theological Institute later this morning [17 April 2016], at the end of a residential weekend for part-time MTh students. The preacher this morning is the Revd Judith McGaffin, priest-in-charge of Buncrana (Fahan Upper and Fahan Lower), Co Donegal, in the Diocese of Raphoe. 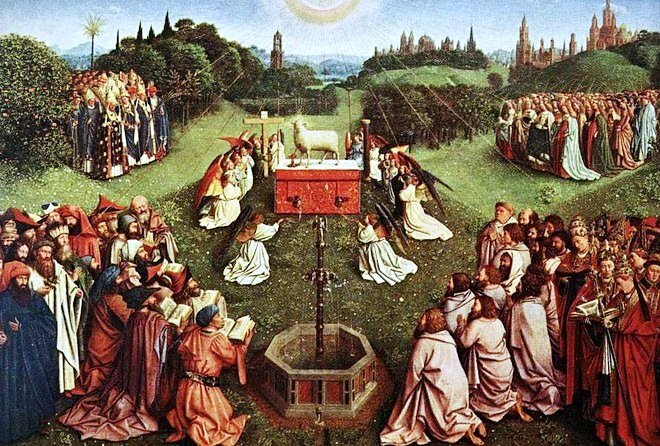 The Readings, Collect, Proper and Post-Communion Prayer are those for the Fourth Sunday of Easter, and remind us that Christ, who was hailed at his baptism by Saint John the Baptist as the Lamb of Good, is the Good Shepherd, is the Paschal Lamb and the Lamb upon the throne. This morning’s readings, collect, preface and post-Communion prayer are those for the Fourth Sunday of Easter, and the Penitential Kyries, Preface and Blessing are those for the Easter season. Processional Hymn: ‘Hear from all nations, all tongues, and all peoples’ (Church Hymnal, 466) was written by the Revd Christopher Idle, who has written over 300 hymns. He is now retired and is an Honorary Assistant Minister at Holy Trinity, Bromley Common. This hymn is based on our second reading, Revelation 7: 9-17. The tune, O quanta qualia, is an adaptation of a melody from François de la Feillée’s Méthode du Plainchant (1808). The tune takes its name from an earlier hymn on the same theme by the French mediaeval scholar Peter Abelard (1079-1142). Gradual: ‘Father, hear the prayer we offer’ (Church Hymnal, 645), was written in 1856 by Love Maria Willis (1824-1908) for an American magazine, Tiffany’s Monthly. The tune Sussex is an English traditional melody collected and adapted by Ralph Vaughan Williams (1872-1958), who first heard it in Sussex. Offertory: ‘The king of love my shepherd is’ (Church Hymnal, 20), is by the Revd Sir Henry Williams Baker (1821-1877), who was the driving force behind the publication of the first Anglican hymnal, Hymns Ancient and Modern (1861). This hymn appeared in an appendix in 1868. This is a metrical version of this morning’s psalm, Psalm 23. The Church Hymnal provides two settings for this hymn. The tune Dominus regit me by the Revd John Bacchus Dykes (1823-1876) was commissioned for this hymn. The tune Saint Columba is an Irish traditional melody with the secant and organ part by Donald Davison (1937-2013). Post Communion Hymn: ‘Come, let us join our cheerful songs’ (Church Hymnal, 332) is by Isaac Watts (1674-1748). It is invitation to worship but is also an invitation to bring the good news out into the world. It is based on the same visionary passage in the Book of Revelation that inspired Handel to write his concluding chorus to Messiah (1742). The tune Nativity by Henry Lahee (1826-1912) was first published in 1855. Readings: Acts 9: 36-43; Psalm 23; Revelation 7: 9-17; John 10: 22-30.